look what the garden gave me for supper Jan 1! all from a plot that gets no direct sun between Nov to Feb! I harvested about 15 lbs of sweet potatoes from 3 plants. I’m amazed that they grow in the shade and seem to mature in cool temperatures. They don’t seem to need much water. 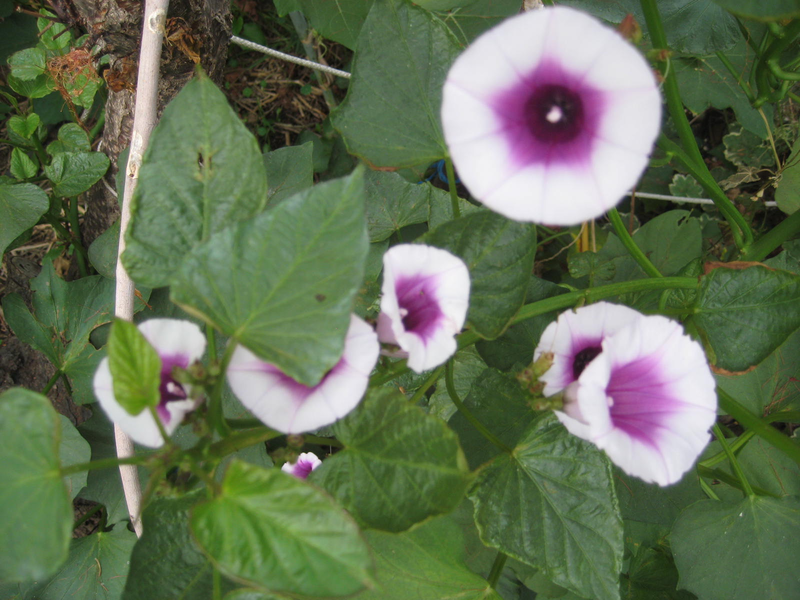 Their flowers were blooming Oct – Dec. Check out the personality of this 4 pounder! You can see that gramma is happy about it too! In this Los Angeles Magazine interview Laura Allen from greywateraction.org answers some common questions about using and installing gray water systems in Southern California. Reading this will give a better understanding of some of the systems we have currently installed at the L.A Eco-Village and the systems you could use on your own home. On Saturday, fellow Eco-Villager Nichole and I trekked over to Whittier for the Secrets of Seed Saving workshop. It was held at the Strub Avenue Farm and Garden, a wonderful backyard farm which is part of a network of urban backyard farms called Whittier Backyard Farms. 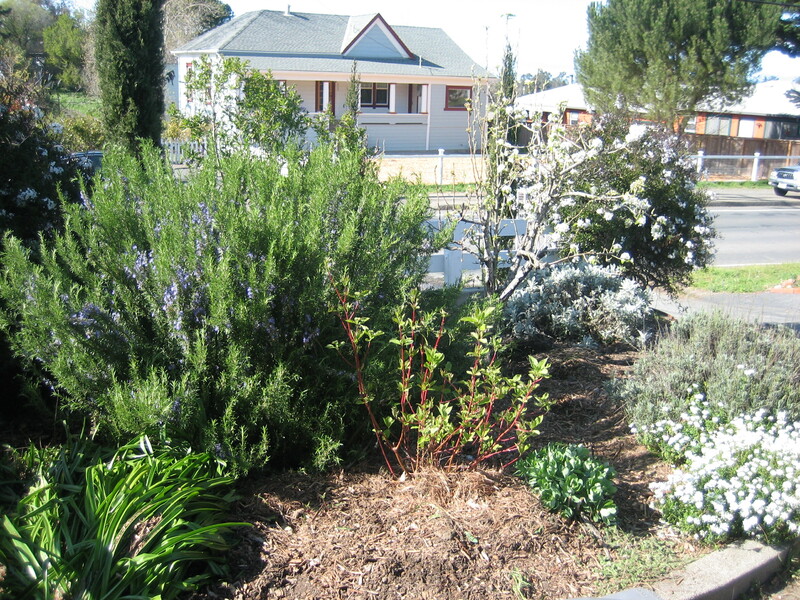 We were lucky to have horticulturalist David King instruct the workshop (left). 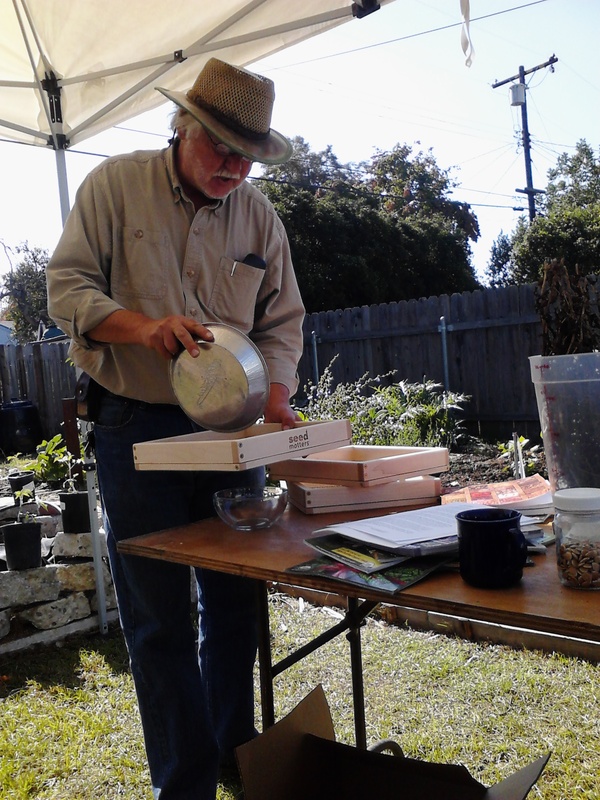 He is the garden master of The Learning Garden in Venice, CA, author of the LA Garden Blog, and chair of the Seed Library of Los Angeles, and gave a fun and informative workshop on how to save seeds and the importance of doing so. David explained the nuts and bolts of how to save seeds for a variety of vegetables. This included how to allow plants to go to seed, and drying, harvesting and storing seeds. 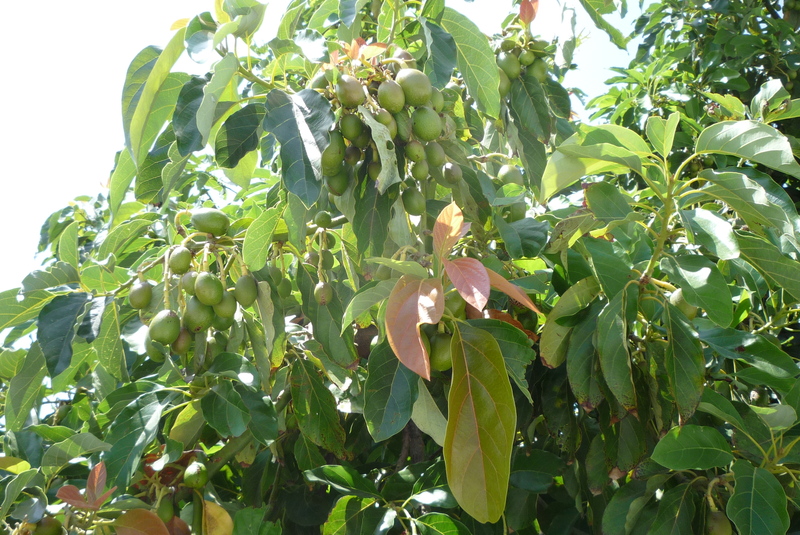 He also covered ways to minimize cross pollination between different species of the same genus by practices such as hand pollination and covering crops with fabric. The most compelling part of the workshop for me was the why. Why save seeds? Traditionally, farmers and gardeners would harvest and save seeds for future growing. In the past several decades, there has been a major shift to purchasing seed annually from commercial seed suppliers, and seeds are commonly developed so that the plants you grow from them do not produce seed that will reproduce the same plant. This has dramatically increased the dependency on commercial seed companies. There has also been a sharp decrease in the variety of seeds over the past century. This handout (right) David gave us shows that there were 408 varieties of tomato seeds available in 1903, and only 79 available in 1983. This is a pattern across many vegetables. The reason this is dangerous, David explains, is that if we are commercially growing only a few varieties on a large scale, and a pest or disease attacks one variety, then we could risk major food shortages. 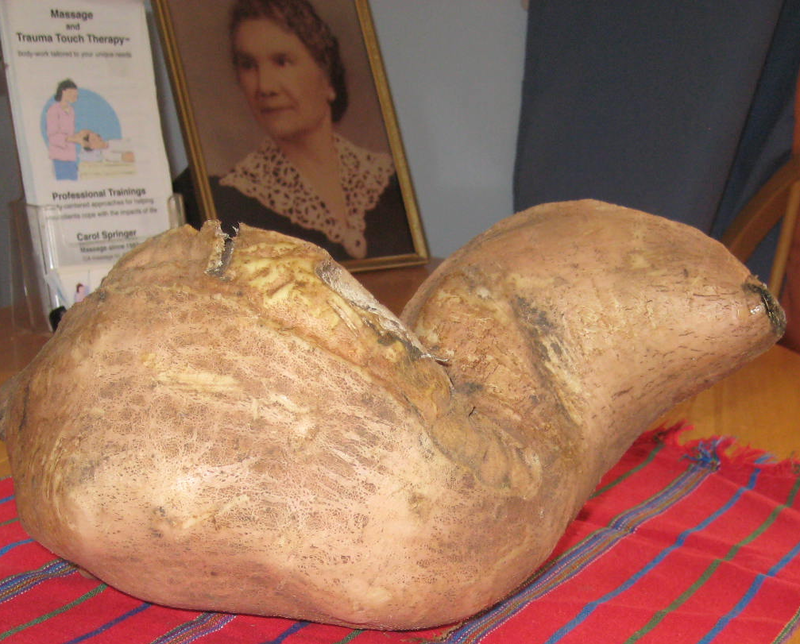 He gave the example of the Irish Potato Famine where there were only 2 varieties of potatoes being grown. A wider variety means more diverse traits, such as different vulnerabilities and strengths to different conditions. After the workshop, the hosts provided a delicious lunch featuring food from the garden. The meal was followed by a seed swap where people shared seeds they either bought or saved. I happily came home with arugula, kale, poppy, calendula, dill and okra seeds. I am newly inspired to continue to grow food, save seeds and share seeds. Thanks to Megan from Strub Family Farm and Garden for organizing the workshop. Great News! Learning Garden Agreement Signed! 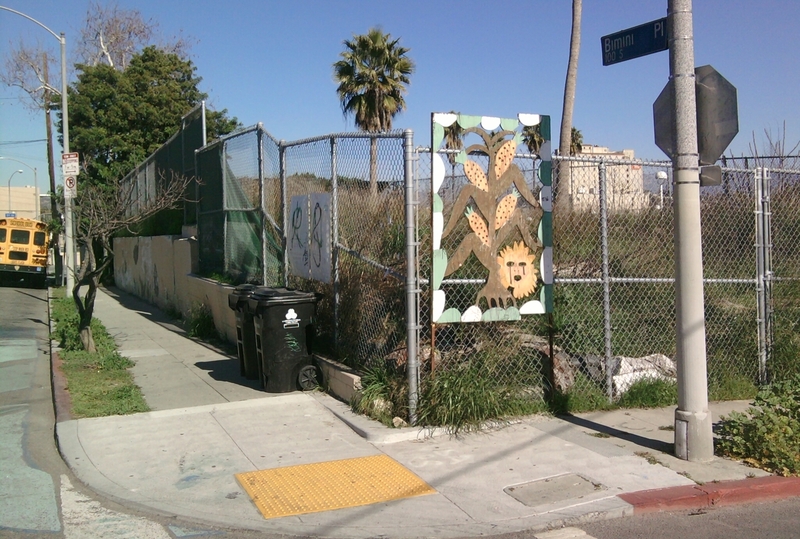 On January 20th 2011, the Los Angeles Unified School District and the Beverly Vermont Community Land Trust (BVCLT) signed the joint use agreement that enables a new learning garden at Los Angeles Eco-Village! The site is the currently-vacant lot at the north east corner of the intersection of Bimini Place and White House Place. ‘urbanite’ being an affectionate name for chunks of broken concrete used for building stuff. 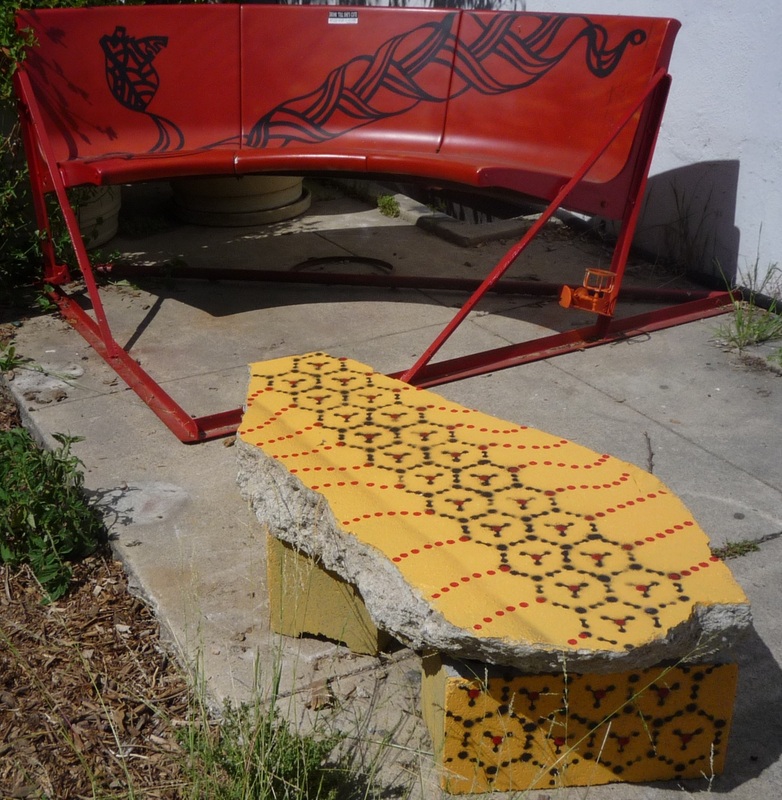 this one piece of urbanite was lying around, unused, and i put it on top of two blocks and decorated it with my bee fever hexagonal pattern. next to the bowling alley bench that rests on a bed frame structure lovingly welded and also decorated by yours truly with the heart and corn-dna pattern. reused outdoor chic. now you know what to do with a 200 pound discarded piece of that crazy stuff we humans poured all over the landscape. i went on the roof today to check on the bees and i snapped a pic of the incoming crop of avocados. i sure hope the squirrels leave some for us humans.